We hosted our first Community Focus Group of this academic year (but the third of our trial) this morning. Once again, we had a fantastic group of students, parents and teachers working together. We started our session by reviewing some of the key highlights from the student and parent surveys. This was a great starting point for our main focus of discussion, reflecting on our indicators of success for the trial. Learning from each other – parents from children, teachers from students and vice versa. Learning in different ways that enrich the learning outcomes. More learning can take place outside the classroom. Develop transferrable and timeless skills that can be used for current and new technologies. (These transferrable skills can include interpersonal skills, communication skills, and balance, as well as technological skills). Teachers, students and parents are learning from each other – children from adults and vice versa. We are learning in a variety of ways. Learning takes place in a variety of locations. iPads are used intentionally to help students continue to develop their skills, experience and knowledge. We maintain balance in our lives. Students feel more confident at risk-taking, learning how to be confident to do different things. Voice recording has made presenting skills much easier to develop – easy to practice, listen, revise. Students are feeling more organized by using Notability in maths – keeps worksheets altogether, less chance of losing things. Students don’t have to learn too many new things, many apps are the same as on laptop. We are learning from each other – for example, students easily taught their parents about frequencies and old people going deaf in science using an app. Teachers are open to learning from students. This is not just a replacement for the textbook, but opens up different combinations of ways to show learning, etc. It’s not that we are learning more, it’s more the way we are learning varies. The iPad can be used instead of a phone – take photos, notes, record ideas wherever I am. I can work on iPad in different environments like a park or a cafe, practicing kanji on the train. Managing projects and multitasking is a good skill we could use for other things, we really have to learn how to manage time and switch between different classes and projects better. The skills of switching between different apps & devices could also be helpful for developing skills of switching between tasks as adults. Expand use certain apps that have been useful in another subject eg Notability. Make better use of, or revise, the “Top 10 Apps”. Sharing our work with others, teaching others how to use things, teaching younger students and even parents how to use apps. 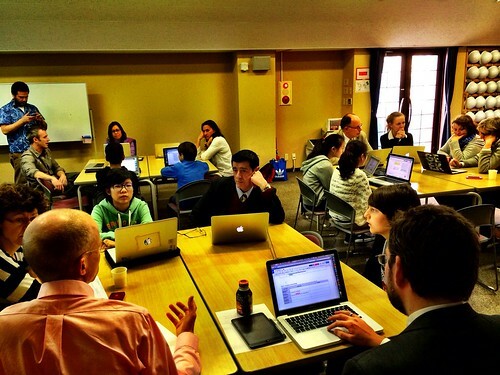 Student and teacher teaching sessions for different apps perhaps during tutor. More teacher-directed use of apps for development of new skills and application across subjects. For new people, both devices can be tricky to learn and use – identify support sources (tech buddy in each class, access to teachers and tech support). Make sure to continue to focus on balance – there is value in both the new ways and the traditional ways of doing things. We will continue to reflect on the trial so far, and plan to implement these suggestions in the next semester. There will be additional Community Focus Group meetings during the second semester to continue getting feedback and reflecting on the process. We are looking forward to seeing our trial continue to grow and develop over the next semester as students, parents and teachers become even more comfortable with having, managing and balancing two devices. On Wednesday, September 24th, we hosted our second iPad Institute to launch this year’s iPad Trial. Once again, the institute was a very successful experience, with the grade 7 students spending a day together exploring and learning about their new iPads. The day was broken down into 4 key parts with a parent presentation the following morning. Attitudes and Behaviors: Our community will be characterized by inquisitive, discerning, open-minded, and self-directed learners who use technology in a balanced and responsible manner. Activity 1: Acrostic Poem: Write your name in the boxes provided. Use the letters in your name to create a poem describing how you will use your iPad as a self directed learner. Learning Environment: Ubiquitous access to technology tools and resources will enhance our learning environment, expanding horizons beyond the physical classroom. This will empower YIS learners to access information, collaborate, and exchange ideas within the YIS community and around the world. Activity 1: Before & After: Use the small boxes of paper to draw yourself learning in one of the environments given or an environment of your own choice. Draw yourself “before” having an iPad and “after” having an iPad. Glue your pictures on to the big paper. If you can’t think of an example for the places given, use the blank paper to add a new location. Actions and Decisions: Our actions and decisions will demonstrate responsible digital citizenship, reflect our school values and create a positive online presence. Activity 1: Manifesto: Write your own contract with yourself describing how you will make good choices with both of your devices. List 5-7 commitments you will make to ensure you will make good choices with your iPad. Sign and date it at the end. Activity 2: Gingerbread People: With this activity, student will label the gingerbread men with statements that show how a persons acts/feels with the ipad. Example: With these hands, I download apps that will help me at school. If time, students can add “accessories” (earbuds, for instance). Educational Experiences: Educational experiences will be authentic, imaginative, and provide for different learning paces and styles. Learners will be encouraged to become independent and enterprising in order to meet the challenges of a constantly changing world. Activity: Tableau: With your group, stage a scene that shows what you image a learning environment will look like with two devices. Ask a teacher to take the picture using the iPad provided. Upload to the YISCLC Instagram account (already open on the iPad) and write a description of the scene in the caption. Community: Our Connected Learning Community will provide a sense of identity and belonging that will enrich our overall school community and connect us with others around the globe. Activity 1 Headlines: Write a statement about how the iPad will allow you to connect with others. Have a 1 minute discussion, take 30 seconds to write your own headline, then share your headline (identify 1 positive quality for each), and finally create a group headline. 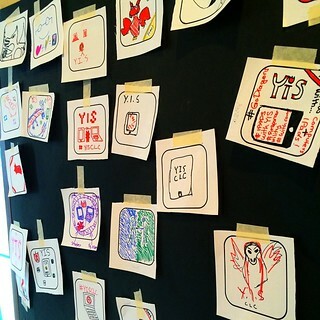 Activity 2: Create an App Icon: Create an app icon that represents your community with an iPad. Choose a color, symbol and name that represents the message of the vision statement. We learned a lot about this process last year, and were able to set up the iPads in lightning speed this year. Creating their Apple IDs in advance was very helpful, and we went through the process very smoothly. Once the iPads were unboxed and ready to go, the students connected to our AirWatch YIS store (which is how we’re distributing all apps to students) and then they started downloading our top 10 apps. As soon as they had most of the apps, we had them partner up with anyone else who was finished to complete this scavenger hunt to customize their iPad and start familiarizing themselves with our apps. For the final block of the day, we did a wrap up of their learning and made sure to answer any remaining questions. We also spent this time planning and preparing for the parent session the next day. For the first two periods the next morning we had about half of the grade 7 parents join us for an introductory session. We showed the following presentation, and the students highlighted their learning throughout. Our 2:1 trial has officially started with our first ever YIS iPad Institute! The Institute was a day and a half, with the first day focused on students and the second day offering a combined session for parents with their children. and how to use the top 10 apps that will be used in many subject areas during the trial. For an overview of the day, please check the schedule here. Students started the day with lots of questions about why we are implementing this trial, and at the end of the day they were able to answer those questions for themselves. They talked about the many different learning opportunities the iPad would give them (particularly to interact with the device, to be able to write and draw naturally, to be more mobile with their learning, and to be able to share their learning in more multimedia formats). We spent lots of time thinking about how learning could be different in a 2:1 environment, structured around the five key themes of our CLC vision statement. During this time students participated in many different activities which gave them a chance to identify areas of strength and growth for them. Many students highlighted their excitement about being creative, independent, and self-directed in their learning. They also noted the importance of taking good care of their devices, being responsible for their own learning, and maintaining a good balance between the different things they do. Students set up their new iTunes account and were able to download the top 10 apps, as well as dozens of other apps that the school will provide through our specialized YIS iTunes Store (using AirWatch). Once they had access to all of those new apps, they spent the afternoon learning, and then teaching others, how they work and how they can be used for learning. 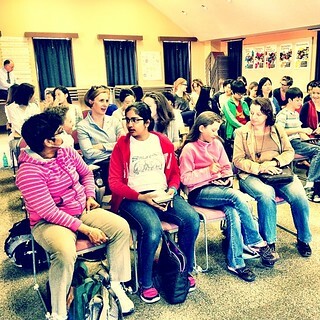 On Friday morning, we concluded our iPad Institute with an introduction session for parents, joined by their children. This was a great format for our introduction because it allowed the students to show their parents how they will be using their iPad, and it offered a great opportunity for both students and parents to ask thoughtful questions and everyone could hear the responses together. how they can really dive deeper into analyzing real-world activities like sports in PE or science experiments using Coach’s Eye. We highlighted the value of the iPad as a personalized device – rather than a shared device. The way it’s designed, with multiple apps to log in, rather than just one log in when you turn on the device (like a laptop), makes it extremely cumbersome to share. Plus, the amount of media and data that’s stored on the device to customize it so that it works perfectly for you (ie: your e-mail, photos, videos, and all those log ins) mean that it’s especially challenging to share. This is one of the key reasons why each student has been issued a device, rather than using carts. Finally, we reflected on the fact that as society changes, and the use of technology in the “real world” changes, it does affect the way that we need to teach and learn. Although this can be challenging, since everyone in the room has successfully completed school and feels a strong attachment to the system they learned within, it’s important to note that our job is to help prepare students not only for the present learning environment, but also the future. When we think back to just three years ago, when an iPad as a device was almost unimaginable, and now today it’s common place, it helps remind us that we really don’t know what the future will bring. Building transferable skills, confidence in learning new things, and the ability to adapt to any environment are all essential parts of this trial. We’ll be hosting another Community Focus Group after the end of the trial (after May 30th), and we’ll also provide an opportunity for all parents and students to share their feedback. Please ask your children to share their experiences with you during the trial so you can get an idea of what they’re doing and why. More updates and examples will be posted here on the iPads blog as well. 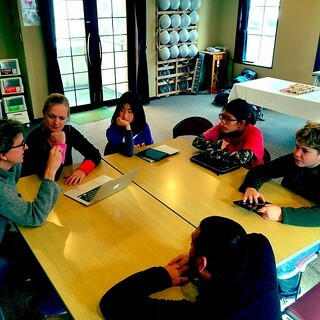 One of the biggest themes to come out of our conversation was that because iPads, particularly in this kind of educational context, are new to all of us here at YIS, we will all be learning from each other. This means that we can be open to not knowing all the answers, that different members of our community will have different levels of experience, and that we all have something to share and something to learn. This is a great opportunity for us to define what iPads can do for our community, and to focus on our specific needs. Our CLC leverages advanced technologies and progressive teaching approaches to enhance student learning, promote collaboration and facilitate the creation and sharing of knowledge locally and globally. Community: Our CLC will provide a sense of identity and belonging that will enrich our overall school community and connect us with others around the globe. Overall, our Community Focus Group found this time together so beneficial, that we have decided to meet again after the trial is over to reflect on the process. Even if you are not part of the Focus Group, all stakeholders involved in the trial will be asked to share their feedback through (at least) a survey, based on the key themes this group has identified.